This function gives you fast and easy access to all the necessary information to provide customer service for posted invoices on file for a customer. 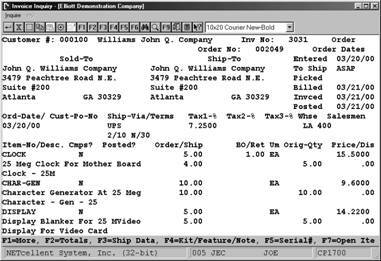 It allows you to quickly access and display a customer invoice using many different lookup options such as Customer P/O number, Ship-To number, or Serial/Lot No. for an item. You can also view items invoiced to a specific customer, as well as, customers that have been invoiced for a particular item. Additionally, you can also do customer referrals to consumers calling to buy your product from resellers/distributors in their area. From the COP Inquiry menu, select Invoice History Inquiry and then Inquire. [F7] = Search by P.O. Search window for Customer 100 and all invoices. 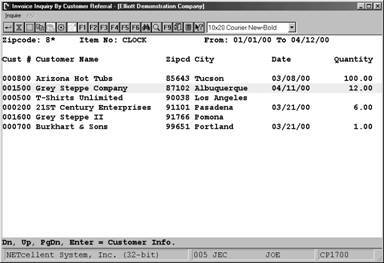 As you move the scroll bar up or down, it highlights the invoice and displays the customer information at the top and the invoice details on the right portion of the window. To view a highlighted invoice, press the enter key. Note: This screen view is controlled by the Setup defined for the Order Inquiry function. The lower menu bar of the above screen gives you additional [F] keys to view data. 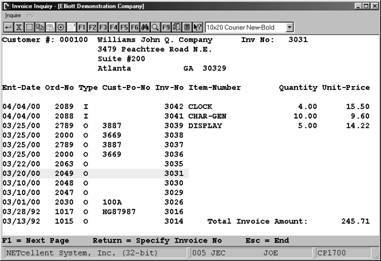 F2: See invoice totals, (Sale amount, misc. charges, freight, and sales tax). 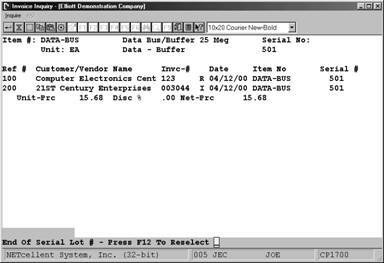 F3: Position cursor on line item to view shipping data. F4: Position cursor on line item to view Kt/Feature and Note information. F5: Position cursor on line item to view serial/lot numbers if applicable. F7: If the invoice has been posted or partially posted, you can view the A/R Open Items created by the postings. These are convenient features because sometimes you and the customer do not know their customer number or they cannot be found by customer name in the system. Also, many times it is faster to simply look up an invoice by the customer P.O. To use this method in the Inquiry by Invoice screen, press [F1] in the customer number field. Similar to “Item By Order Inquiry” in the Order Inquiry function, but for invoiced items only. 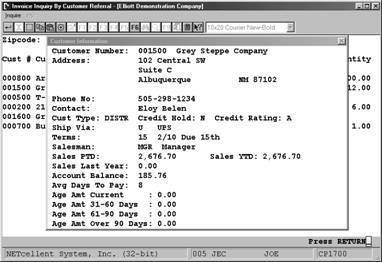 Similar to “Customer By Item Inquiry” in the Order Inquiry function, but for invoiced items only. This inquiry also allows you to select customer’s last transaction only, e.g., if he has bought Item “Clock” 24 times, it will only display his last invoice for that item. Invoice Inquiry By Serial/Lot No. This is an extremely useful search when you need to find a Serial or Lot number for warranty purposes. Additionally, you can inquire on a customers invoice by using the Serial or Lot number as your search criteria. In doing an inquiry you do not need to enter the item number, simply tab over from the item number field to the serial number field and enter the serial/lot number. See completed inquiry screen on next page. The ZIP Code search uses the callers ZIP and begins searching from that number forward, (ascending order). To look for ZIP Codes in both directions, forward and backwards, you can use wildcards in you search. For example: The caller ZIP Code is 87112. If you enter his ZIP Code as 8*, the system will start matching for ZIP Codes beginning with 80000.